By Krista Baliko Posted: January 8, 2019 5:00 a.m. Responding to the way most people now watch content, a University of Regina professor is releasing his new feature film online. Mark Wihak, associate professor in the Faculty of Media, Art, and Performance, has written, and is now directing and producing, Resting Potential. The feature will be released online in nine chapters in fall 2019. He adds that online platforms offer new opportunities for filmmakers. Kaitlyn Semple, who plays the film’s main character, Lucy, says this format also makes the content accessible to more people. While Wihak won’t divulge much about the plot, he does reveal that the focus is on Lucy, who experiences profound changes because of her beliefs. “The film is an intersection of different sorts of beliefs – spiritual, scientific, and political – and how they affect our behaviour,” says Wihak. Semple says she jumped at the opportunity to land the lead role in an independent film. She also admits that playing the character has changed her. “Walking in Lucy's shoes has made me a more curious and compassionate person,” says Semple. 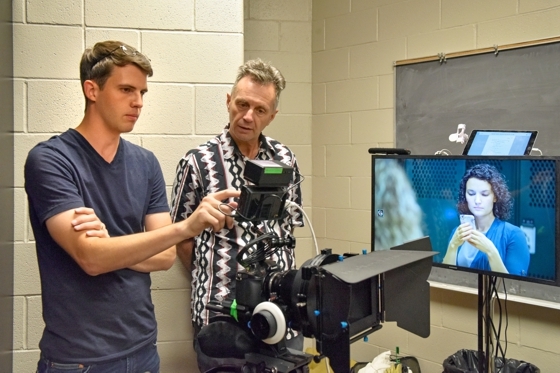 Resting Potential is created by a team of actors, cinematographers, lighting designers, a sound and design team, a composer, and an editor – many of the creative contributors behind the film are alumni of the University of Regina’s film department. Mark Wihak’s project is supported by the Humanities Research Institute, the Saskatchewan Arts Board, the President’s Seed Fund, the Saskatchewan Filmpool Cooperative, and ACTRA.